In this study, the unique properties of graphene were tested for their possible use in detectors, specifically thermal detectors also known as bolometers. This study aims to investigate the temperature coefficient of resistance (TCR) at room temperature, dependence of voltage with temperature, optical responsivity and time constant of a thermally reduced graphene oxide (TRGO) bolometer. We show a large negative TCR of -4.26 % K-1 with a responsivity of 20 V/W and a moderately fast time constant of 20 ms, comparable with other graphene-based bolometers. These characteristics show that TRGO has a potential for an effective absorber for bolometers. G. Tolentino, M. Andalis, M. A. Madarang, R. A. Paragas, M. Ilasin, and I. J. Agulo. 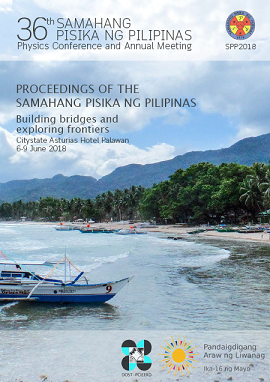 Preliminary investigations on the bolometric response of thermally reduced graphene oxide (TRGO), Proceedings of the Samahang Pisika ng Pilipinas 36, SPP-2018-PA-24 (2018). URL: https://paperview.spp-online.org/proceedings/article/view/SPP-2018-PA-24.